I love having a hearty oatmeal for breakfast in the morning. The warm and gooey texture, topped with whatever toppings I am craving in the morning is a delightful breakfast treat. 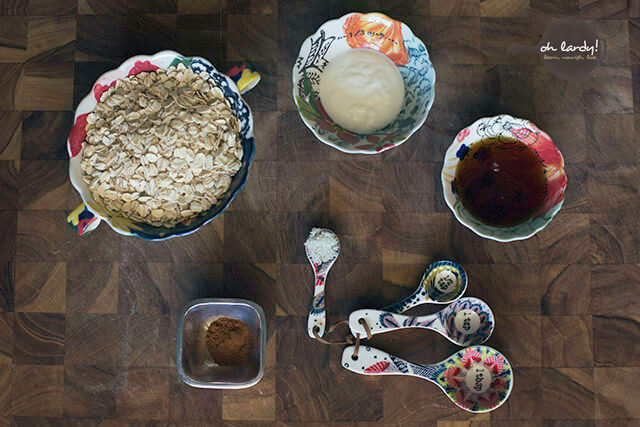 When I was a child, my favorite oatmeal was one that was in a little package – Maple and Brown Sugar. Considering both “Maple” and “Brown Sugar” don't appear anywhere on the ingredient list, I knew there had to be a better option. I used to make plain oatmeal and top it with cream and honey. Sometimes I would mix in a little peanut butter, maybe top it with some fruit that I had on hand. It suited me and my family just fine. Everyone liked it, there weren't any complaints. Since beginning this Real Food Journey, I started to realize the benefits of soaked grain. Grains contain anti nutrients – namely enzyme inhibitors and phytates. These prevent our body from assimilating valuable nutrients locked up inside the grain. By soaking grain (as well as nuts, seeds, legumes, and beans) in an acidic medium, we neutralize these enzyme inhibitors and phytates, making the nutrients in the grain more bioavailable. Now, I am all for making my bowl of oatmeal more nutrient dense, but I was concerned that the acidic medium would sour the oatmeal to a point where my kids didn't really like it anymore. So, in order to mitigate the sourness, I decided to throw a little maple syrup in the pot, as well as cinnamon. Because, really, who doesn't like cinnamon? In the morning, I was treated to my childhood favorite. This oatmeal tastes like the Maple and Brown Sugar packet of oatmeal from my youth. And my kids love it too! To start, gather all of your ingredients. Throw them into a pot and add water. Set it on your stove and cover until morning. In the morning, you will find a well soaked oatmeal. Turn on your stove and cook until heated through. Once, it is heated to your liking, serve it in bowls topped with whatever suits your fancy! We like milk or cream, fresh fruit, and coconut. 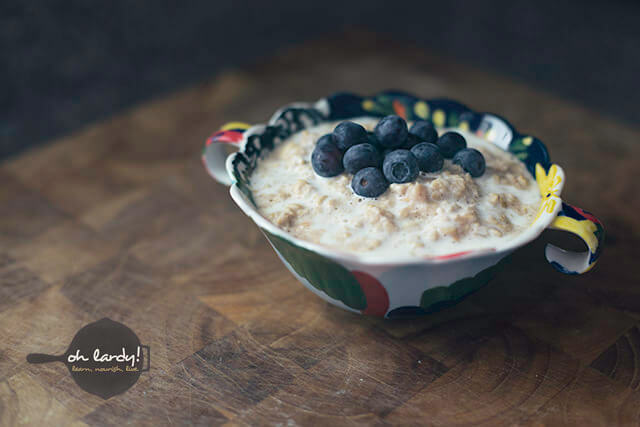 The lacto-fermented berries are fantastic on this oatmeal! Place all of the ingredients into a pot and mix together. Cover and let it sit and soak overnight. In the morning, cook on your stovetop and heat through! Serve it in bowls or cups with your favorite toppings! What are your favorite toppings for oatmeal? We love oatmeal every morning. Will do it this way from now on! Cinnamon absolute favourite topping… How do I activate nuts? I have soaked nuts in salt water and then dehydrated them. After the soaking and dehydrating the nuts I add them to oatmeals and cookies and such! I pick blueberries myself, so most of the time we have frozen ones. I make the oatmeal and then I just put a handful of berries and they defreeze in the porridge! And voila’ everything is at perfect temp for eating! Frozen raspberries is good to. Sometimes I slice down banana. I thought that the point of soaking the grains was to start them sprouting. If you use rolled oats, how does that work? Or is there another benefit here that I’m missing? It does sound good though! Hmm. I love oatmeal. I can’t afford (or find) raw milk yogurt. I do have some 0% Fage Greek yogurt… think that would work as well? Sure! Any acidic medium would do just fine. Sometimes I just use whey! I used fage and it did not taste good at all. I wonder what I did wrong? It was too sour. Any suggestions? Perhaps the greek yogurt doesn’t have enough whey. I always use full fat yogurt. Sometimes it is a bit sour for me, but that is usually because I eyeball it and sometimes I put in too much. 🙂 Try again with full fat yogurt and see how it goes. Keep in mind that it will have a sour taste (because the grain is soured), but it never is overwhelming for me. The maple syrup usually counteracts it enough. So, if you are used to really sweet cereals, it may take some getting used to. I know these posts are a few months old. But, I just finished a 6 month class around the Nourishing Traditions Techniques. What I learned about any greek yogurt is that it is made by dripping the whey from the yogurt. That is how it is thicker than most Full Fat Yogurts. Organic Full Fat Yogurt products are best for Traditional Food cooking. I attempted this and it was horrible. I used greek yogurt. Any ideas? I addressed this in your comment below. 🙂 Good luck! This sounds great, however I have one question: what constitutes and “acidic medium”? My daughter does not tolerate whey…we can use full fat Greek yogourt since it has been strained and has very little whey in it but judging from the previous posts, that may not be a viable option. Great question…I did not have any yogurt or whey last night and used about 1/4 cup raw apple cider vinegar. It was fine. I have also used lemon juice in a pinch too. Also, kefir can be used (either milk kefir, coconut kefir or water kefir). Good luck! Tamara Mannelly recently posted…Stop Feeding Your Baby Cereal! Thanks for posting this! I’m just starting to get into the whole thing with soaking my grains and beans, and this really helped me out. I tried this a couple days ago. I used greek yogurt, then read the comments from people saying it doesn’t work, so I went back to the pot and added some acv, and it turned out delicious! The acv works well with the cinnamon. I like to eat it with frozen wild blueberries. Yum! If I want to add nuts to the mix, should they be soaked overnight as well in the same pot? Tried this for the first time, this morning. It was fabulous!! My 7 year daughter loved it! I used my milk kefir instead of yogurt. Thanks for the recipe!! I do this 3 times a week since my son and I love our oatmeal. 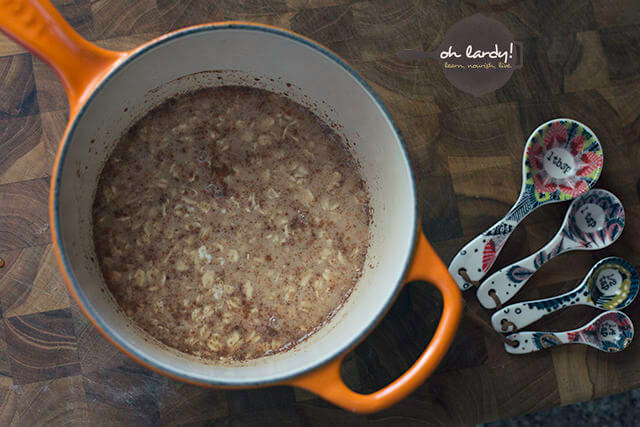 We use steel cut or rolled oats-always organic and untoasted and I let it soak for 12-16 hours where its warmest on my stove. I use cultured buttermilk or whey from my raw, full fat yogurt. Whats all the rage about greek yogurt by the way? is that all people eat now? anyhoo…this is what I wanted to add: I diminish the water by about 1/4 cup…when I cook it up in the AM, I add 1/4 cup coconut oil and raisins…this is hands down, the best way I’ve found to disguise coconut oil-you can’t taste it-it doesn’t visibly show up in the final product-the oats just absorb it…its also great to use with some water for reheating cold oatmeal (sometimes I make extra and refrigerate it). I hope everyone makes this as its incredibly good, nutritious and unsoaked, plain oats are really high in phytic acid. I thought that you are supposed to rinse the oats after you soak them? I’ve read that from several bloggers, they say because you need to wash the phytic acid away. I’ve tried it and the soaked oats are really hard to rinse and make a bit of a mess so I’m just wondering it’s is actually necessary or not? Thanks! Some people mention rinsing oats but it is unnecessary. The phytic acid is reduced from the process of soaking in an acidic medium. Here’s an article from the Weston A Price Foundation. http://www.westonaprice.org/faq/faq-grains-seeds-nuts-beans The only time I try to rinse my oats is if I use lemon juice instead of whey or yogurt. I find the lemon juice makes the oatmeal taste weird, to me! Can I use Almond Milk? I have never soaked oatmeal overnight so I’m a little nervous about it. Almond milk instead of yogurt? No. You need an acidic medium for the soaking. Lemon juice works. Or coconut milk yogurt! 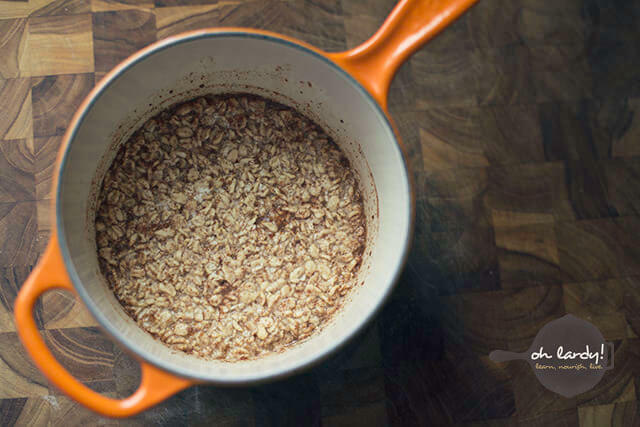 I have a recipe that calls for toasting steel cut oats in butter before cooking. I have started a plant-based diet that calls for no added fats/oils so I found the toasting in a dry pan yields a similar result. My question is whether soaking after the toasting will achieve the desired reduction of phytic acid?